For more than 40 years, IBM® mainframes have supported an extraordinary portion of the world's computing work, providing centralized corporate databases and mission-critical enterprise-wide applications. The IBM System z®, the latest generation of the IBM distinguished family of mainframe systems, has come a long way from its IBM System/360 heritage. Likewise, its IBM z/OS® operating system is far superior to its predecessors, providing, among many other capabilities, world-class, state-of-the-art, support for the TCP/IP Internet protocol suite. TCP/IP is a large and evolving collection of communication protocols managed by the Internet Engineering Task Force (IETF), an open, volunteer, organization. Because of its openness, the TCP/IP protocol suite has become the foundation for the set of technologies that form the basis of the Internet. The convergence of IBM mainframe capabilities with Internet technology, connectivity, and standards (particularly TCP/IP) is dramatically changing the face of information technology and driving requirements for ever more secure, scalable, and highly available mainframe TCP/IP implementations. The IBM z/OS Communications Server TCP/IP Implementation series provides understandable, step-by-step guidance about how to enable the most commonly used and important functions of z/OS Communications Server TCP/IP. 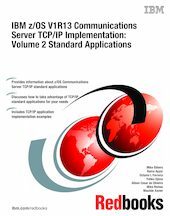 This IBM Redbooks® publication provides useful implementation scenarios and configuration recommendations for many of the TCP/IP standard applications that z/OS Communications Server supports. This book does not duplicate the information in those publications. Instead, it complements them with practical implementation scenarios that can be useful in your environment. To determine at what level a specific function was introduced, see z/OS Communications Server: New Function Summary, GC31-8771. For complete details, we encourage you to review the documents that are listed in the additional resources section at the end of each chapter.